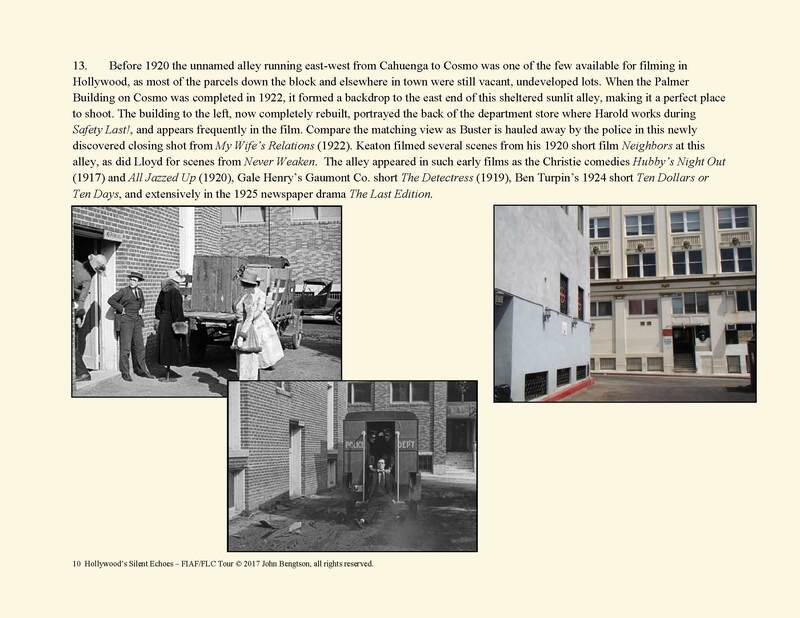 [Tour download] Late in 1921 a mob of angry police chased Buster Keaton down a narrow Hollywood alley towards Cahuenga Boulevard. 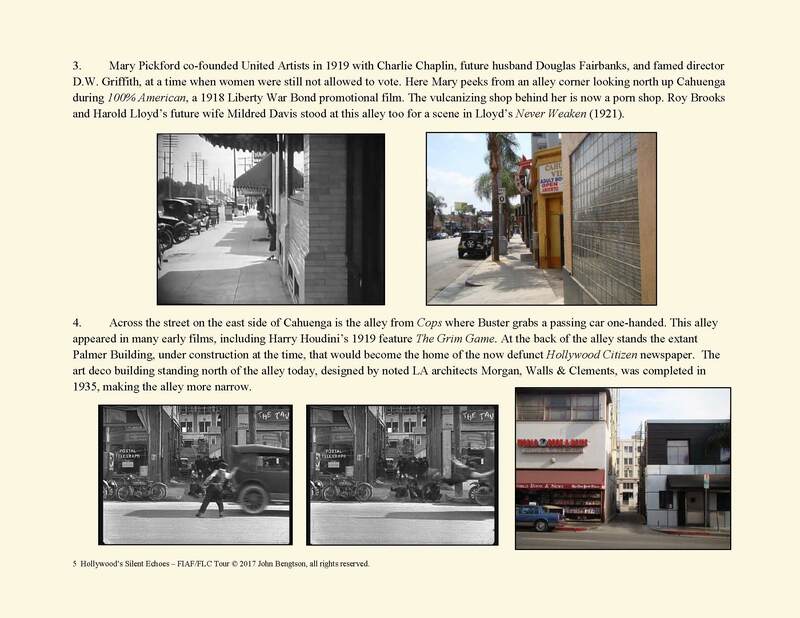 Entering the street Buster saw to his right a corner where “America’s Sweetheart” Mary Pickford filmed a scene in 1918 beside what is now an adult book store. 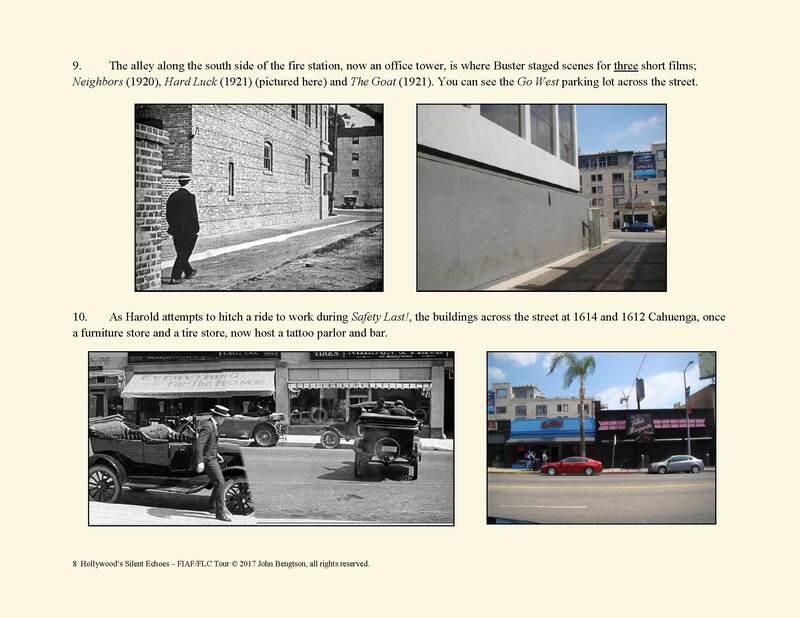 To his left Buster saw the former Hollywood fire/police station where he would shoot five different films. 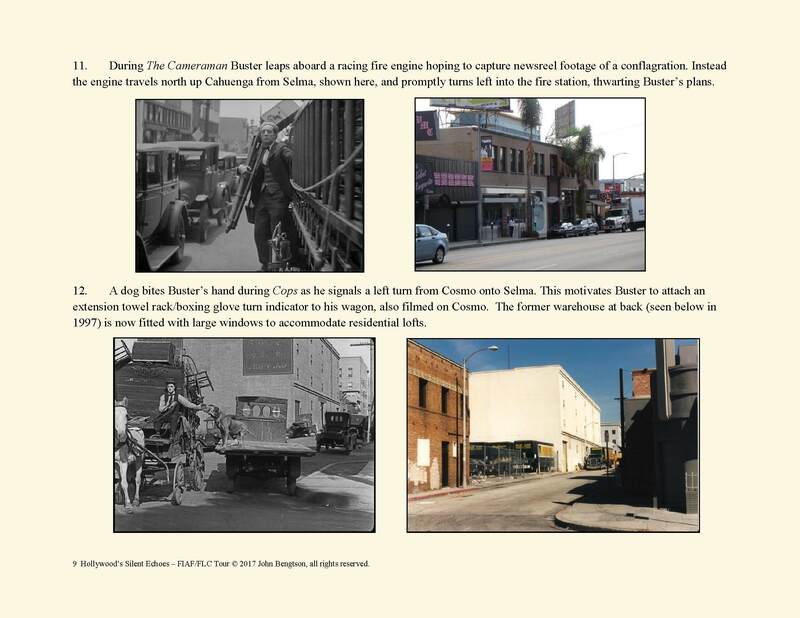 All seems lost when Buster boldly stops and turns to face his pursuers – then suddenly, grabbing a passing car one-handed, he flies out of frame to safety. 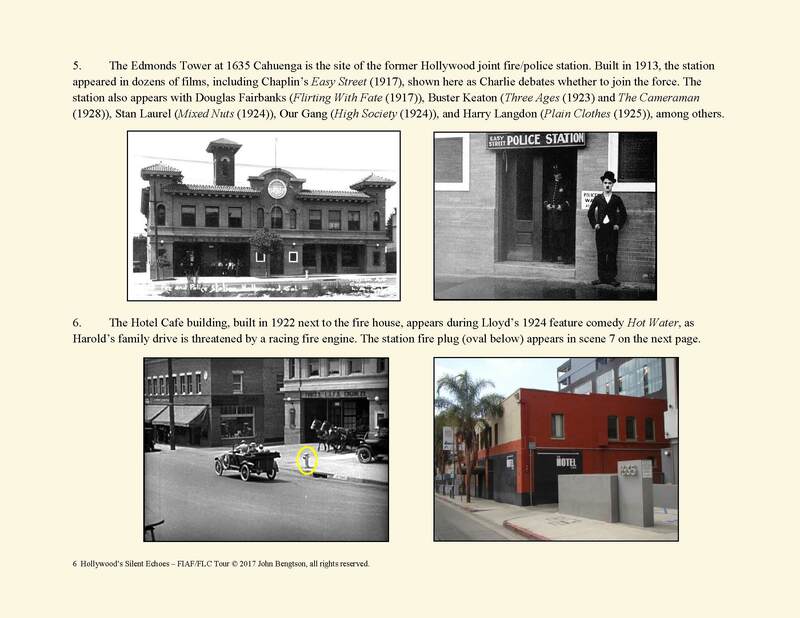 This breathtaking stunt, appearing in Keaton’s most famous short film Cops (1922), was filmed on Cahuenga just south of Hollywood Boulevard. 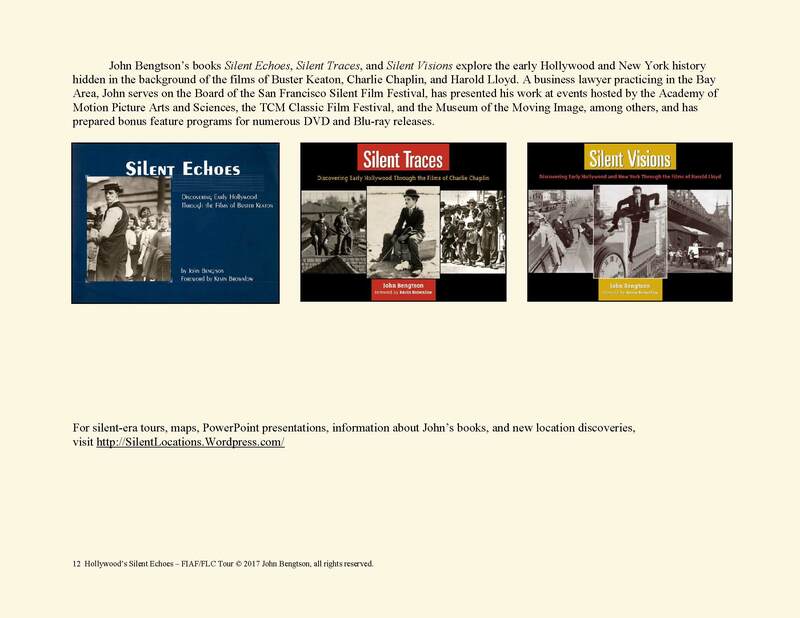 Unburdened by union rules and truckloads of sound equipment, the silent movie filmmakers roamed freely seeking the best locations to shoot. 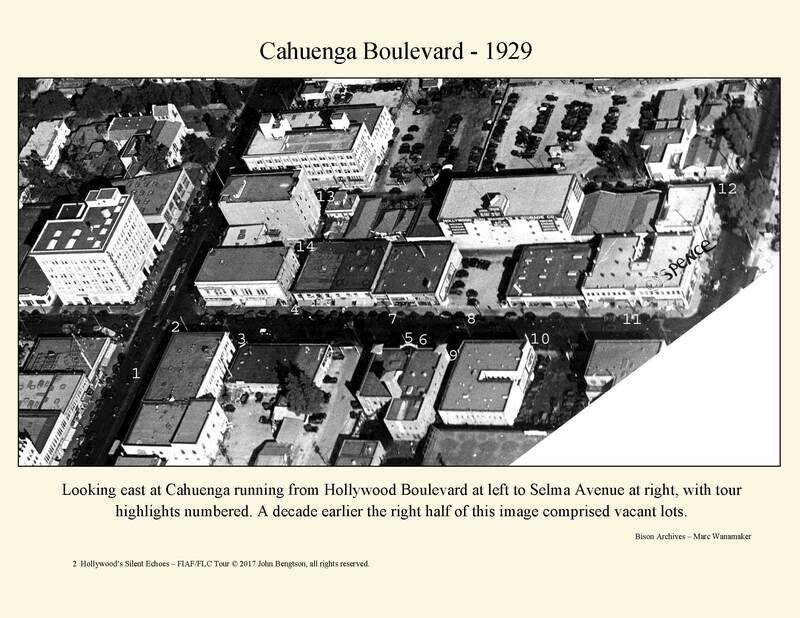 In the process they created a vast photographic record of early Hollywood and Los Angeles, capturing historic streets and settings that often no longer exist. 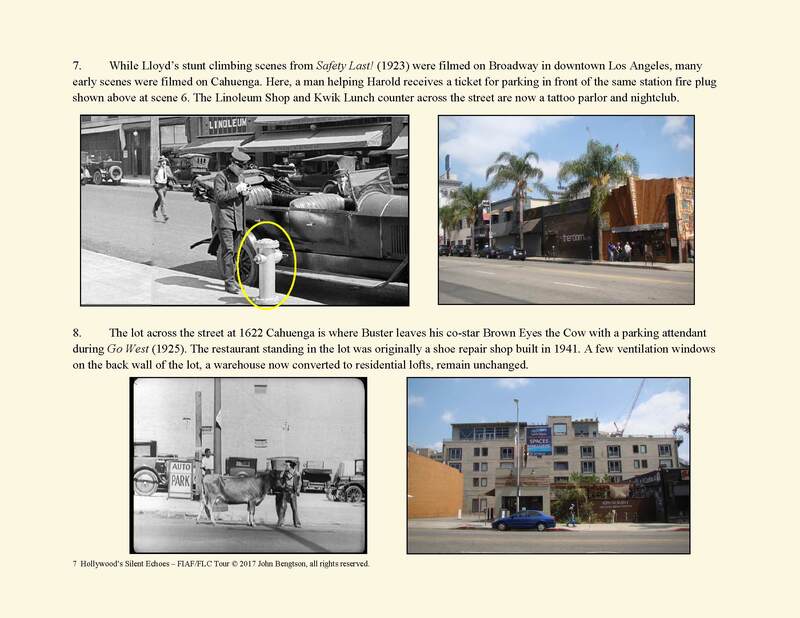 But as fleeting images projected on a screen, this record remained hidden in plain sight for decades until digital technology allowed us the time to freeze these moments and take a closer look. 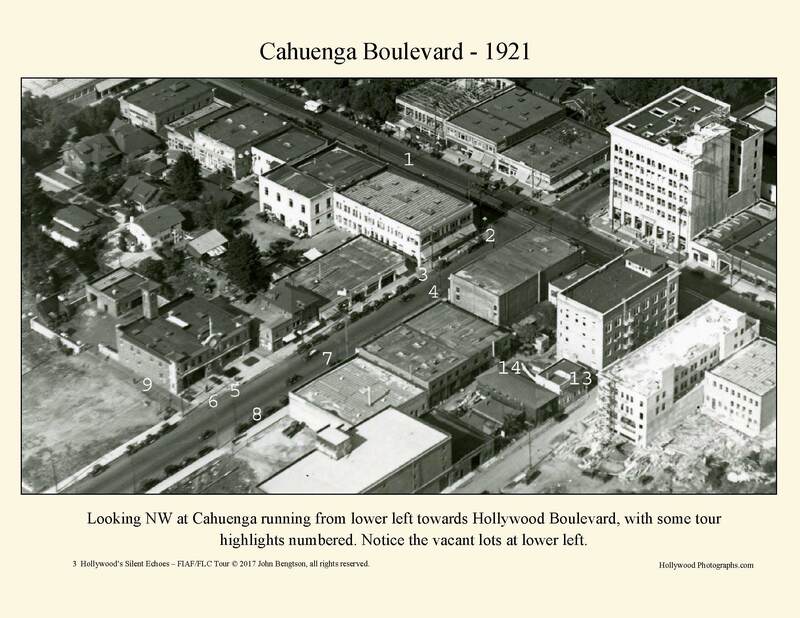 Remarkably, the great silent film comedians Charlie Chaplin, Buster Keaton, and Harold Lloyd filmed more frequently on the block of Cahuenga south of Hollywood Boulevard than at any other spot in town. It’s easy to speculate why. 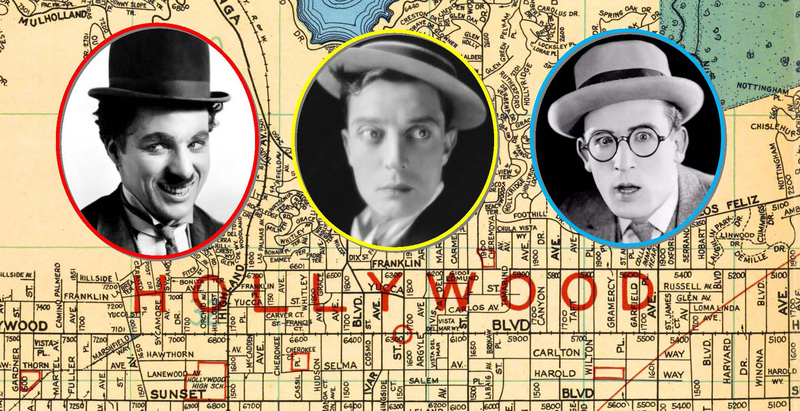 All three stars had studios close by (the Keaton Studio was just six blocks to the south), and with its numerous alleys and generic commercial buildings, filming on this “urban” street saved them from making trips to downtown Los Angeles to shoot. 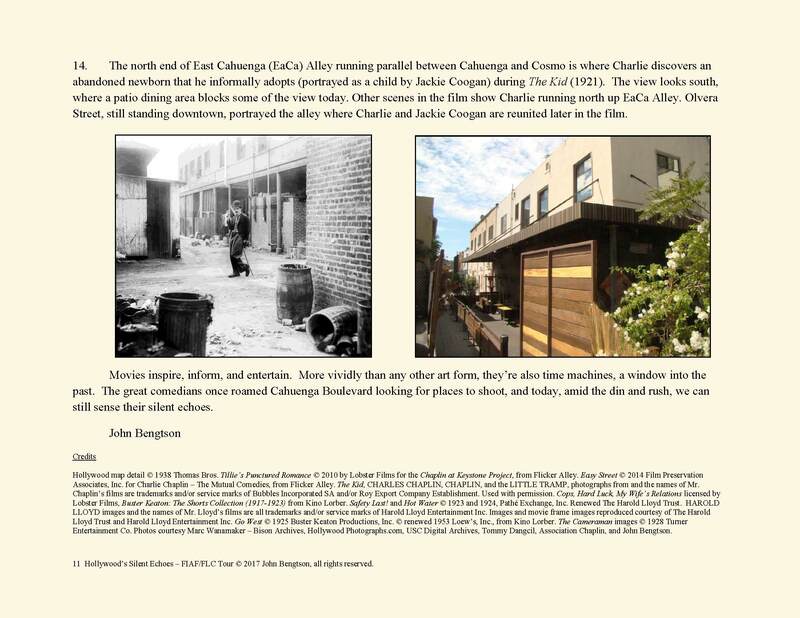 More remarkably, each star filmed an iconic masterpiece, The Kid, Cops, and Safety Last!, respectively, at the same Cahuenga alley. 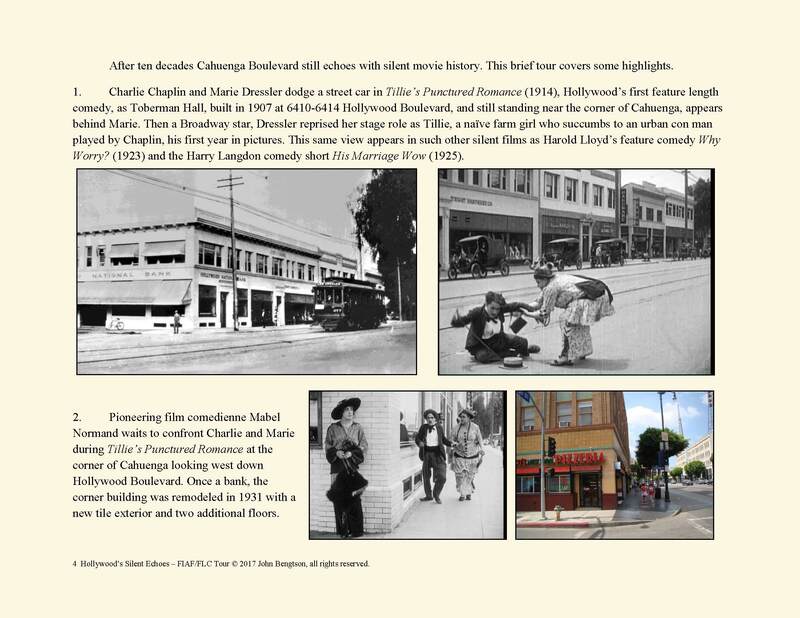 This entry was posted in Buster Keaton, Charlie Chaplin, Harold Lloyd, Hollywood Tour and tagged FIAF, Hollywood, Hollywood Tour, Silent Comedians, Silent Comedies, Silent Movie Locations, Silent Movies, then and now. Bookmark the permalink.